Cockatiel Nutri-Berries are a complete and nutritionally balanced diet which include seeds and grains. 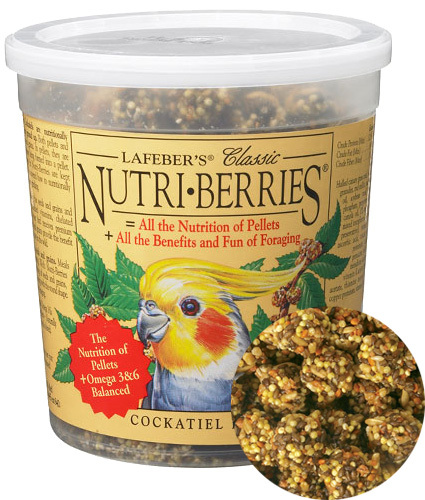 By hulling the seeds and grains and then coating them with stabilized vitamins, chelated minerals, and amino acids, your bird receives the balanced nutrition essential to good health, these whole seeds and grains provide the benefit of whole foods, just like birds enjoy in the wild. Because of the whole seeds and grains, Classic Nutri-Berries offer multiple tastes and multiple textures essential for optimal foraging. Pellets only offer a single taste and a single texture because the ingredients are finely ground and blended together. Every pellet has the same taste and texture, which as a daily diet, is as boring for most birds much as it would be for people.